Writers and artists of all kinds, I wonder if you are feeling blocked today. 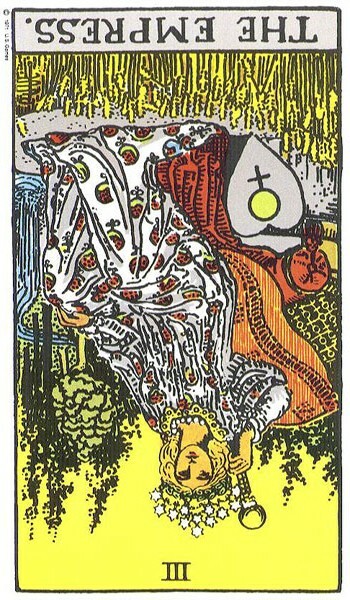 These cards look to me like a creative project (The Empress) is ready to be born (or at least conceived) and move forward, but we are still hesitating over the best path to take (Two of Wands reversed–sorry, my Two of Wands jpg file has gotten corrupted somehow and I can’t include it this time). There’s also an element of considering how to move forward in a way that will be helpful to the community and to the world at large. These are good things to be thinking about and considering, and our intentions are very good. However, don’t neglect that project for too long. It’s ready to be started on now. Another interpretation of these cards is for couples considering whether or not to try to conceive–it looks to me like you’re not ready yet, though still thinking hard about it! If you’re thinking that hard, you probably are ready — you’re just trying to go slow and be responsible about it. Nothing wrong with that. Thank you so much for your card, I strongly felt that this card was for me, too. Bonnie, YOU are awesome! Keep up the outstanding work! Many Blessings!